Thats what goon said as we tucked into a pot roasted bird I’d bought as a bargain at the weekend. I found the thing, clearly mislabelled as a “small” chicken in Sainsbury. It obviously belonged in the medium or possibly even large section but somehow had got lost and was being sold for a mere £2.70. Now, if you’re anything like me, you’ll agree that there is no such thing as overly moist chicken. I find that 90% of the time when I’m eating at pubs or mass catered functions (shudder) they’ll serve up some overcooked bone dry excuse for a bird that glues your teeth together when you try to chew on it. It’s the reason I’ve declined several dinner invitations and never order chicken in restaurants if I can help it. My discovery, which is all thanks to Julia at a ‘Slice of Cherry Pie’, of pot-roasted chicken made me very happy indeed. If there WAS such a thing as chicken that is too moist, I guess this would be it. I thought it was flipping fantastic! I tried out the idea after seeing it on Julia’s site. I used exactly the same method but omitted the potatoes and used them to make some mash to mix with the gravy that ame from the pot. Once Goon got used to the idea, he really enjoyed the chicken but it did confuse him for a while. Now, if only we could get a pot rosted chicken to have the same depth of flavour as guinea fowl, that would be a perfect chicken. Yes, I succumbed to mutton curry again. I know it isn’t as exciting as trying out caper sauce (and I promise I will do that as soon as I buy a mutton leg) but last night I was in the mood for something rich and comforting with lots of flavour. A cream and nut based curry was ideal and gentle spices appealed so I decided to make a korma. The recipe for this curry is subtley different to the Mughlai-korma I made with king prawns a few weeks ago. The spice level is a bit higher to balance the stronger flavour of the meat. Also this curry takes about 3 times longer to make as the mutton needs to stew in the sauce for at least two and a half hours. The good news is the meat is on a very gentle simmer and requires minimal attention, so you can go and amuse yourself in whichever way you please until it is done. The mutton came from the leftovers of the rolled neck I used to make my biryani, which had been taking up space in the freezer for a while. It appears that mutton freezes well. The meat cooked just as well as it had when it was fresh. I began by blending some finely chopped onion with cardamom seeds, garlic and ginger to make a paste. Then I gently fried some sliced onion in the paste with ground cumin, coriander, cinnamon and garam masala until the onion was soft. Then I added the paste and the mutton and browned the meat, topped it up with lamb stock and left it to simmer. After 3 hours had passed and the liquid had reduced a lot I skimmed off the fat, added ground almonds and cream and adjusted the spice balance. Then it was pretty much ready to serve so I quickly made some pilau rice. *Well, maybe a decent sized slice of ostrich fillet does, but you know what I mean. And I mean FULL of mushrooms. At some point last week I was planning on making a quick meal from a venison haunch steak I’d bought at Notting Hill’s farmer’s market. I’d been discussing what to make with Goon over MSN and decided that a red wine sauce would be nice but I was also craving pasta. So I thought that a pasta side with porcini mushrooms, pine nuts and other things thrown in would do. When I got to Goon’s I got a bit of a suprise. I hadn’t asked him to do any shopping but he thought he’d be nice and go anyway. He’d gone to get mushrooms for me but, on arriving at the shop, had forgotten what mushrooms I wanted. So he bought them ALL. On the table there were chestnut mushrooms, organic chestnut mushrooms, organic baby button mushrooms, large button mushrooms, closed cup mushrooms, some non-descript general mushrooms and large portobello mushrooms. Seven packs of mushrooms at 300g each. No porcini mushrooms. Goon (probably fortunately) didn’t know mushrooms sometimes are dried. So I went back to the shop and got some. beef stroganoff with added mushrooms and a mushroom and leek medley to accompany some nice rare roast beef. Today and tomorrow I’m having mushroom and roast beef sandwiches. Then I’ll be making some chicken and mushroom pies. At the end of this week I’ll never want to see another mushroom again! The roast beef probably deserves its own post but I can’t be bothered today so I’ll just leave you with the pictures. It was very nice and perfect for sunday night. I crusted it with wholegrain mustard and served it with a port gravy with roast potatoes and the mushroom-leek concoction. Living near the Goldhawk Road is something of a mixed blessing. On the one hand there are bullet holes in some of the windows, a large number of unsavoury characters that hang around late at night and a very obvious brothel. On the other hand the road has a suprising number of very well priced good quality restaurants. Last week i returned to the Polish restaurant Patio which has impressed me each time I have visited it. The decor here is homely, much like you’d expect a Polish Grandma’s living room to be. The service is very efficient, occasionally a touch brusque but never rude. I have to recommend the £16 three course menu. There are a variety of Eastern European Specialities including white borsht, herrings with soured cream and Bigos (Hunter’s Stew). I think you’d be hard pressed to find food of equal quality at this price. My main course of Duck Polonaise was to die for. They certainly have perfected the technique of producing wonderful juicy slow roasted meat that melts in the mouth. The roasted lamb was equally good. The starters and desserts paled in comparison to the main courses but were still of a very good standard. The meal comes with a choice of flavoured vodka and each one I have had so far has been very nice. This comes from someone who usually hates vodka! The wine list is also reasonable (£10-£20 ). The Beaujolais I had with my meal certainly was worth the price. So if you live in this area you should try Patio. It’s reasonably priced with good service and excellent food. If mutton’s having a renaissance I guess I should take advantage. I wanted to make mutton with caper sauce, since it was apparently a great classic in the 19th Century. But I didn’t know my cuts of mutton well enough and only did my reading after I’d bough a rolled boned neck. The traditional cut for the caper sauce is mutton leg, because it produces a much richer gravy which adds flavour to the sauce. So after scoffing at my parents for only ever using mutton in curries ( and making it tough as shoe leather too), I couldn’t think of a use for this particular batch of stewing mutton apart from biryani. How embarrassing. Fortunately for me, I had some good advice on how to cook it and it turned out to be lovely and tender. Now that I’ve tried good mutton I agree with all of those who say it is a much better meat for a curry than lamb is. It has much more flavour and, if you cook it long and slow, it has a fabulous texture too. Next time I have mutton, it will be a leg with caper sauce. The problem with living in a student flat is that you have to share a fridge. The fridges are, more often than not, FAR TOO BlOODY SMALL. Even if they aren’t too small, in the interests of saving money, students will bulk-buy rubbish until either the door won’t shut or the fridge refuses to chill anything anymore. This is the situation in Goon’s flat, where the majority of my ‘exciting’ cooking is done. It’s reached that nasty stage when everything in the fridge is either at the front and warm or at the back and frozen. Unfortunately my leftover pheasant fell into category 1 and reeked more than a little on the day when I’d decided to make a mixed game pie. So I thought, “Ok, just venison and rabbit in the pie then.” Thenl I remembered that the unfortunate disability of our last rabbit meant we had none left over. So that left just venison and not all that much of it. Digging frantically through the fridge, I found a dubious substitute for the pheasant. The left-over roasted guinea-fowl we’d had with pomegranate dressing a couple of days earlier . The pie needed bulking out, so in that went. And eventually, out came this. Admittedly, pheasant would have given the pie a little extra richness but the guinea fowl was ok. The slow braised venison was lovely. I’d had it marinating in red wine, port, beef stock, with garlic, cloves, halved chestnut mushrooms and rosemary for about 12 hours, then put it in the oven at Gas Mark 2 for 3 hours. After taking it out of the oven, I decided it needed a little something extra so I added a square of dark chocolate and some cranberry sauce before stirring in and heating through the guinea fowl. Then I made a shortcrust pastry base, put in the filling and topped it all with a puff pastry lid. Finally I glazed the pie and baked it until the pastry was cooked. In my opinion, a nice ruby port makes a big difference to a venison pie. The two flavours go together so well! This pie ended up being very good value for money too. It used about 500g of venison (for £5) and about a quarter of the £2 guinea fowl and made four fairly big portions. Rule no 4 when trying to get good photos of food: Don’t let a goon carve your meat. Apart from being hacked to pieces, this guinea fowl was fantastic. It was even better for costing £2! The idea for the pomegranate dressing came from Gordon Ramsay but I didn’t like his recipe. It used orange juice and grapefruit juice. I thought it all sounded a bit too citrusy and I thought I’d prefer the pomegranate flavour to come through more. After a bit of thinking, I decided that rosewater had a nice subtle flavour that would complement the delicate pomegranate. So I juiced up two and a half pomegranates and added just under two tablespoons of rosewater and a tiny bit of honey. The guinea-fowl was roasted with butter under its skin and a honey glaze over it. And the combination was perfect! We had some cous-cous tossed in olive oil and topped with pine nuts as an accompaniment. A very tasty light meal! It appears I have come to a stage where it isn’t possible to update the blog everyday. This annoys me a lot. I’m still cooking every day and I still have plenty to say but not nearly enough time to say it. This is for two main reasons. There’s this annoying thesis thing I have to write at some point and a PhD supervisor reminding me about it all the time. I need to work to earn money now, since I was dumb enough to join Imperial in the year before they decided to hand out 4 year funding grants. Grr! Work at the moment involves marking 1st year work and, judging by the scripts I get in, most of the first years are illiterate and innumerate. Assisting in problem solving classes have confirmed these suspicions for me. I spend up to 8 hours a day writing offensive comments on their work, which is occasionally satisfying but mostly irritating. So from now on blog posts will only be up once or twice per week. With any luck I’ll have enough tutoring jobs to let me write more. Tutorials are great - they earn twice the money for half the time and effort. It’s true I like to impress, but that was just dumb.For a start I didn’t get to Goon’s until 7pm. Not good as I hadn’t done any prep work. 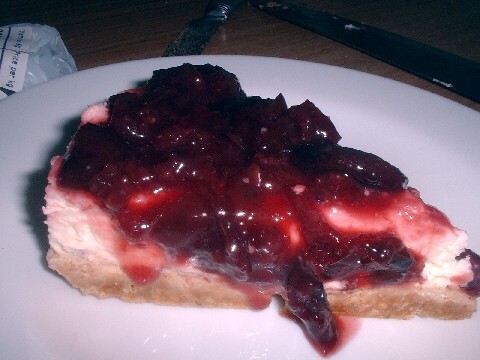 I started by making the dessert, my alchoholic cherry cheesecake, as it needed a long time to chill. The base was simply crushed digestive biscuits soaked with amaretto and set with butter . While that was in the freezer, I whipped together some cream cheese, marscapone and double cream for the middle and added some lemon juice and zest. Then I made the topping with black cherries simmered in their own juices with some sugar and a good slug of cherry brandy. After assembling that and leaving it chilling in the fridge I moved onto the main: ostrich ‘wellington’. My ostrich had been marinating in a mixture of apricot brandy and orange juice. I coated it lightly with a duck and port pate, wrapped it in some rather haphazard rosemary crepes (the weighing scales had gone walkabout so I had to guess quantities) and wrapped it all in puff pastry. And yes, I had the practially blue bit in the middle. Finally it was time to make the starter, just in time for everyone to arrive. This was seared scallops with ‘champagne’ (or cava) risotto and truffle oil. No major hiccups here, despite this being the first time I cooked scallops. The only problem was I had forgotten to buy any nice looking salad so I had to borrow some iceberg leaves. Goon and the others turned up at about 10:30pm, so dinner was very late. I was fairly pleased with all of it. I think that there might have been better risottos to make than a champagne flavoured one but I thought the title sounded impressive. The ostrich Wellington was great. I didn’t expect it all to be eaten but it was devoured pretty quickly. So quickly that it got half eaten before I could get proper shots. Here is a slice with somenew potatoes beans and a port reduction. I think Simon (Goon’s brother) enjoyed it and that was the main point. When I went to pick up the meat to make my ostrich wellington I noticed something rather intruiging on the stall. Ostrich liver for £4.50 with the claim that it was comparable to calves liver. How could I resist? So the next week I went back to grab some. The idea of blending lightly flavoured vinaigrette with figs and serving it over calves liver came from the book ‘Secrets’ by Gordon Ramsey. It hadn’t let me down so far so I thought I’d give it a go with the ostrich. The ostrich liver was very nice but I don’t think it’s quite right to say it is similar to calves liver. It has a slightly stronger more grassy flavour. As a result it overpowered the accompaniments I’d chosen for it. To be honest I think it would have gone better in something like this chicken liver and mavrodaphne recipe. It’s definitely one to try again though!